This blog post is a client/server file sharing or transfer application in C#, the application is made up of two projects, it can be tested on a single computer but, its capability will be best seen if tested on two computers, one running as a client while the other is a server. Before we dive into coding, its essential to understand Socket which is the most important aspect of network programming. Socket is an object that represents a low level access point to the Internet Protocol(IP) stack, it is used to send and receive data, thus it can be opened and closed, the data to be sent is always sent in block known as Packet. Packets must contain the IP address of both the source of the packets and the destination computer where the data is being sent, and optionally it may contain a Port number. A port number is between 1 and 65,535. A port is a communication channel or endpoints on which computers can communicate. It is always recommended that programs use port number higher than 1024 to avoid conflicts with other applications running on the system, because no two applications can use the same port. Packets containing port numbers can be sent using UDP(User Datagram Protocol) or TCP/IP(Transmission control protocol). UDP is easier to use than TCP because TCP is more complex and has longer latencies, but when the integrity of the data to be transferred is more important than performance, then TCP is prefered to UDP, and thus for our file sharing application TCP/IP will be used because it guarantees that our file does not become corrupt while being transfered and if during the transmission process a packet is loss, it is retransmitted thus making sure that our file integrity is maintained. Thus, this application will allow you to send any file from one computer to another, personally I have used it to send a 350mb file from one desktop PC to another. Now to get started, create two new windows forms applications one named FileSharingServer and the other FileSharingClient. Now, for the FileSharingClient windows form application add three textboxes and two buttons to the form just like the screen below. Rename the textboxes and buttons appropriately. When the browse button is clicked an object of OpenFileDialog is created to open a dialog to get the file name of the file to be sent. When the send button is clicked, the SendFile method is called and handled in parallel so that the main form user interface does not get frozen while the file is being sent and the processors are fully utilized in a multi-core environment. The SendFile method accepts IP address and port number of the destination computer as well as the file path and file name. Both the file name and the file are converted to bytes and sent to the destination computer using the TCPCLient and NetworkStream classes object created. 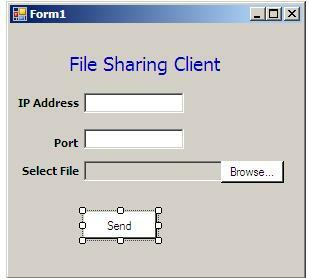 The user interface of the file sharing client application is shown below when run. 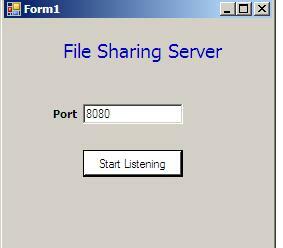 At the file sharing server application, a port number is supplied, on which the server will be listening to an income file to be recieved. Just like the file sharing client application, the start listening button when clicked, invokes the HandleIncomingFile method in parallel. A TcpListener object is created to start listening for incoming file at the specified port, when a connection is received the a file with the same name as the file sent from the client is reconstructed from the received bytes and saved to the C drive and then an event is fired to indicate on the server user interface that a new file has been received. When the event is fired, all subscribers to the event are notified and in this case the event handler method Form1_NewFileRecieved is invoked and the code to display a message box and open the folder containing the file received is wrapped around the form BeginInvoke method to avoid thread errors. 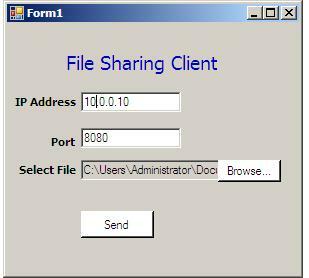 sir i am final year student my project is based on same file sharing system, need some extension from you sir.... i want to modify my application, by now my application communicates between 1 to 1 i.e server to client n vice-versa but now i want to make it with multiple clients..need some help!!! @Aarthi this line of code Socket handlerSocket = tcpListener.AcceptSocket(); waits for an incoming connection, it will not proceed further until a connection has been established, I mean until a client computer connects to the server computer. @Taki sorry my reply is coming late I have been busy lately, you can use your computer as both the client and server, it will still work, as for where the file will be, the sent file will be dropped in the root folder of you C: drive, you can change it in the code to wherever you like. this very useful information can this project use full this way after send data to the server to automatically resend data to back to the client after severer done some calculation finish 2)do u use any webserver(service )to do such thing? 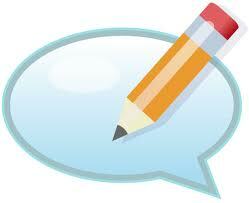 @Chamara, that is quite possible, communication can be from the client to the server and the other way round. The code doesnot use webservice, it uses .Net TCP/IP classes, but you can equally use WCF to achieve the same purpose. @Zeshan its good to hear that, as pertaining to your exception, its likely your code is trying to access a path where it currently does not have permission, you can see if elevating the application to an admin will solve it. Its not the same name, "NewFileRecieved" its an object of the delegate, the delegate was not used directly an object of it was created. Respected Sir i am using .net 3.5 and it does not support Reference System.threading.task. So i cannot use this line "Task.Factory.StartNew(() => HandleIncomingFile(port)); MessageBox.Show("Listening on port"+port);" Is there any other way of writing this code? hi sir, now im connecting 2systmes in lan dat works perfectly ,but my problem z im sending only small size files only like 9kb... but i want to send large files also please give me a sol..
@Chinna are you using the source code here, if yes, I have tested it and so have others, it does maintain the integrity of the file when sent, and it does not corrupt it, I have used it to send a file of 400MB in size. Sir, as one of the computer is behaving like a server so is it necessary to install software for making a pc behaving like a server? and are the devices connected to a particular network over which they are communicating? What you want to achieve is Network Multicast, the application here does unicast. Hi Ayobami, Thanks for project. I tested and working.